For people wanting to make a portrait of their furry friend, I wrote an article on pet memorial mosaics using April Costigan’s work as illustrations of what is possible in terms of capturing likeness. The problem is that for many people, the task of rendering a realistic portrait of their pet is beyond their current skill level. Fortunately, it is possible to make a pet memorial mosaic without the pet’s portrait and still make it personalized and specific to that pet. For example, instead of attempting an image of your pet, consider spelling their name in mosaic and making the surrounding area significant in terms of colors and found objects. More on that later. 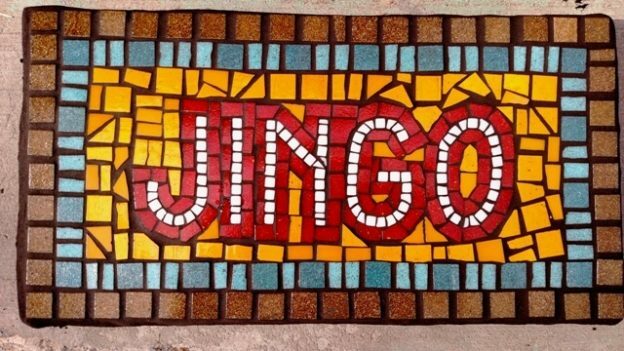 Artist Jill Gatwood emailed us some pictures of some pet memorial name plaques that she has made, and they are good examples of the visual interest that can be created in the background with patterns of contrasting colors. I wanted to show these off because I think people who aren’t confident in their ability to draw will be inspired to make their own versions. 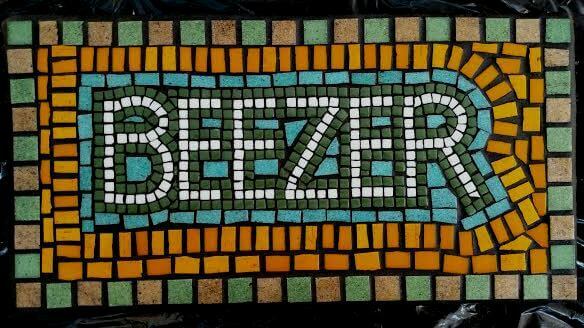 Beezer Pet Name Plaque Memorial Mosaic by Jill Gatwood. TIP: Dog tags and ceramic figurines or broken pieces of an old water bowl or food dish are great ways to personalize a memorial mosaic provided they are sealed to prevent freeze damage. TIP: You don’t necessarily need found objects to personalize the mosaic. If your pet had a favorite toy or blanket, you could reproduce the outline of the toy or the pattern of the blanket using glass mosaic tile. If your pet memorial name plaque will be outdoors, you should avoid plywood, MDF, and other materials vulnerable to moisture. Instead, you should use a concrete stepping stone or a piece of flagstone or large porcelain floor tile for the backer. Customers report that an 18-inch square porcelain floor tile makes a great backer for outdoor mosaics, and these can be cut with a wet saw if you needed a different shape. Jill says that she coats a piece of foam board insulation with several layers of thinset mortar and fiberglass mesh to create an ultra-light waterproof backer. Such a backer could be made stronger by adding a layer of hardware cloth (steel mesh) to the front and back between layers of thinset. When I use pieces of stone and porcelain tile as mosaic backers, I usually laminate a layer of hardware cloth to the backer before tiling. The hardware cloth makes the backer tougher and less likely to crack in two due to impacts or static loading (someone stepping on it). 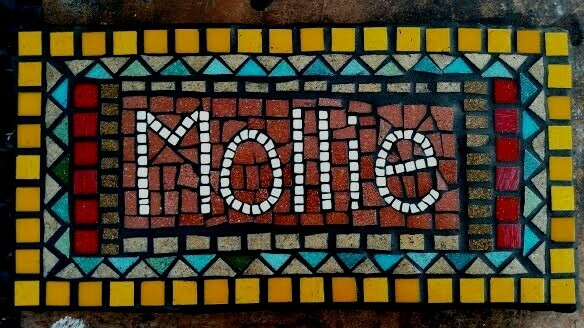 Mollie Pet Name Plaque Memorial Mosaic by Jill Gatwood. I like to place contact paper sticky side up over the pattern and arrange tile on that. Then I pick the mosaic with tape and transfer it to the mortar. Read more about using contact paper and mounting tape to lay out a mosaic design. 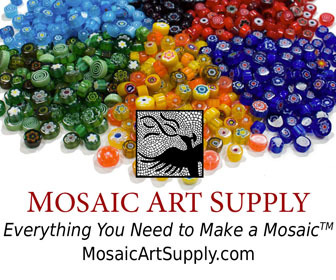 This entry was posted in Art Review, Improving Your Art, Inspiration and tagged animal subject, contemporary mosaic, outdoor mosaic on May 30, 2018 by Joe Moorman.